Full braces also known as “railway tracks”, “brace face”, “jaws”, “metal mouth” and other colourful names that children give each other. Today, orthodontics is well accepted and does not have the same stigma of the past. 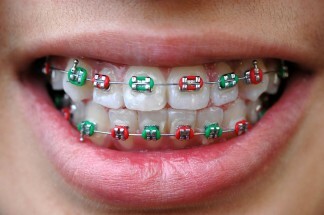 Many adults now have full braces with tooth coloured brackets that are nearly invisible. Or as the first photo shows, children often choose coloured o-rings to have fun with the treatment! 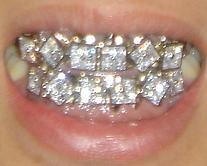 I hope “bling” braces never become fashionable, as shown by the interesting second photo. Some children even get disappointed when they do not need orthodontic treatment! Anyway, item no. 881 is an alternative system of code that includes all visits after diagnosis and treatment planning. This involves a complex course of active treatment using fixed appliances in both jaws. If other appliances such as removable, functional, headgear, or other adjunct devices, they are also consider as part of this item number. If there are arrangements made with a health fund for staged payments then the form structure below is often used. Teeth with braces Bling braces - I hope not!